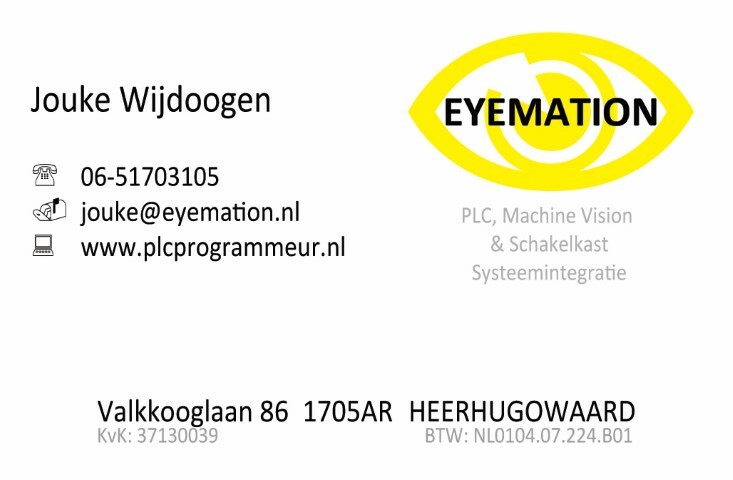 The principal activities of self-employed programmer Jouke Wijdoogen at Eyemation are programming a variety of PLCs , HMI / control panels / operator panels and SCADA systems . There’s been many years of experience from both the practical as the theoretical side in many diverse industries. The knowledge can be showed by the obtained certificates and diplomas that you can find on the website so that you are assured of the right person for the job. Among others I also possess programmers Diploma’s and certificates to always be able to continue working on improvements and optimal uses of the PLC systems. Applying and maintaining of technology serving industrial automation is what is at stake at Eyemation. A well -trained in multiple disciplines engineer / programmer has the skills to present your projects and / or machines. It is also possible to complement the programming work with full electrical system design to engineer means including Eplan P8. The programmer can software for process control and logistics functions compose and perform instant analysis of your process automation as well as intergrade the process visualization of your installation. I’m a well-known member of the OLD Unitronics forum also by the name Ikkez. But lately I don’t have much time anymore to assist on the forum. However I can still help you out on your Unitronics integration projects. Take a look at our website: www.plc-programmeur.nl or www.plcprogrammer.com or just send me an Email. I am very much interested PLC programming, I have more than 12 years of experience AB, Siemens PLC. Let me know if you have any projects to share.